Doing laundry in Dubrovnik used to be such a bore! 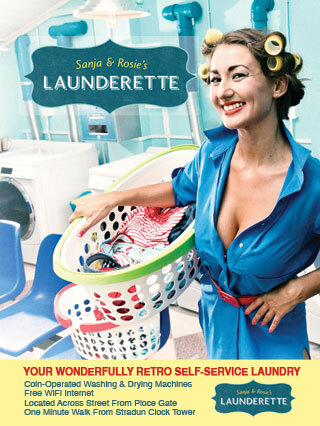 Oh thank goodness for Sanja & Rosie’s Launderette! This wonderful little time machine will transport you right back in time to when cleaning your clothes was a bit more fabulous! The launderette has 12 washing and drying machines for you to use. Each laundry machine is made by Whirlpool and can wash and dry up to 9kg of dirty laundry. If you’ve never used an automated laundromat before, don’t worry! It’s as simple as apple pie, all you have to do is press a button. 1) Put your dirty laundry into any machine from 1-6. 2) Pour a scoop of the free laundry powder into the soap tray (located on the top left corner of the machine). 3) Insert 50 HRK (Kuna) into the LaundryPoint machine. The machine accepts 1, 2, & 5 HRK coins and 10, 20, 50, & 100 HRK banknotes. 4) Press the # of your machine (i.e. if you put your laundry in machine 6, press #6). 5) Walk back to your machine and select a washing cycle. 6) Once the machine has turned on, you will see a count-down timer. It usually takes @ 38 minutes per load. That’s it! You’re done! Feel free to hang around and use our free WiFi internet, read some magazines, or browse through our free book exchange. Otherwise, grab a coffee at one of the nearby cafes, and enjoy! 1) Put your clean laundry into any machine from 7-12. 2) Insert money into the LaundryPoint machine. The machine accepts 1, 2, & 5 HRK coins and 10, 20, 50, & 100 HRK banknotes. Machines 7-8 cost 10 HRK / 10 MINUTES. Machines 8-12 cost 25 HRK / 30 MINUTES. 3) Press the # of your machine (i.e. if you put your clean laundry in machine 8, press #8). 4) It usually takes @ 30 – 60 minutes per load. It all depends on what you are drying and what drying cycle you choose. If you would like to add additional credit to your dryer, simply repeat Steps 2 & 3. 5) Walk back to your machine and select a drying cycle. (If the machine isn’t working, please make sure the door is properly closed. Simply open and shut the door – this usually works;). 6) Once the machine has turned on, you will see a count-down timer. Hooray! Thank you for using our laundry service. We hope you enjoy and have a great stay in Dubrovnik! If you have any problems or need help, give us a call. Our telephone number is +385. (0)91.896.7509.